Trackman Combine Test – Players hit shots to various distances (60 ,70 ,80 ,90 ,100 ,120 ,140, 160, 180 yards) as well as hitting driver. Upon completion of this standardized test, each participant will receive the following feedback: 1. Average distance away from the pin for each shot hit 2. Average drive distance and distance away from centerline 3. A score for each distance and drives on a scale of 0-100 4. Percentage rank for each distance and drives 5. Combined score for entire test. You will learn which distance requires more practice and where your ball control skills rank versus other golfers of your handicap level and/or scratch golfers or tour players. 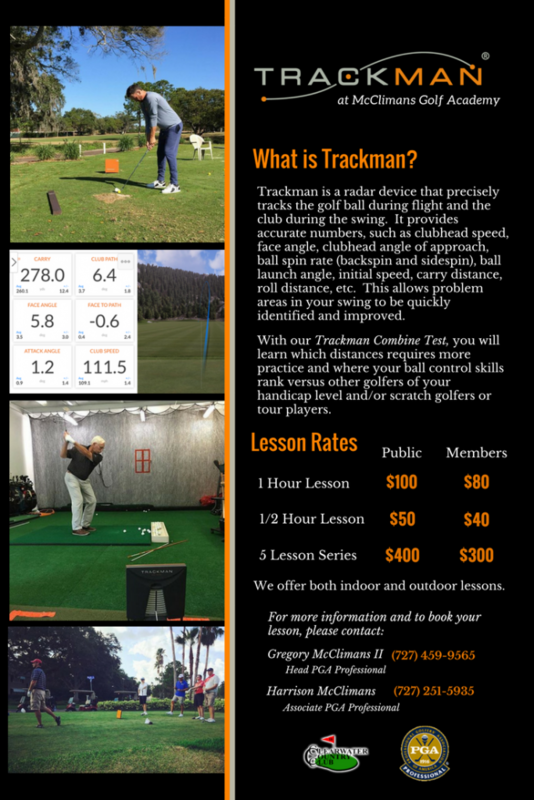 Trackman is available at only 38 country clubs / golf clubs worldwide. It is a wonderful opportunity to use it and quickly understand what makes your golf swing and pitching motion function. Trackman guarantees accurate diagnosis of ball flight mistakes during golf instruction. Coaches work their entire career to hone diagnostic skills to ensure golfers improvement. This machine precisely measures what the eye cannot see, the most important aspect of the golf swing, the collision between the golf club and golf ball. Accurately acquiring this information and gaining a greater understanding of your impact, makes improvement a certainty! Trackman accurately determines how far each club actually travels. To put it mildly, most players don¹t know how far their clubs travel. This is an essential part of being able to hit the ball closer to the pin and improve scores. Trackman allows members and guests to receive tour level club fitting and yardage gapping between all clubs. Every, and I repeat every PGA/LPGA player is fit using Trackman! Trackman adds 10-20 yards’ minimum to your driver immediately. Trackman allows us to optimize your driver specifications and club delivery to produces maximum distance for every golfer, regardless of club head speed. Trackman allows for tour level practice sessions with distance wedges and scoring clubs. Trackman teaches you to control your angle of attack, spin rate, trajectory and distance. Competitive junior golfers who are looking to play at elite colleges will learn where their ball striking skills rank nationally by taking the Trackman combine test. This combine test is something college coaches are looking at when it comes to recruiting. All levels of golfers can now accurately and objectively benchmark their game with Trackman Combine. Trackman will objectively tell you what golf ball is best for your game. Trackman stops the guessing and searching for improvement. It benchmarks your game, improves practice sessions and your ball control skills.